Summary: A high school student (like always) got caught in the middle of the invasion of his country. He discovered a mecha named Valvrave, which now he's on an avengeful mission to drive away the invaders. Personal comments: One thing about mecha animes and galactic warfare anime is that even it's war, they rarely show up close on how people get kill. In fact, in most of them, despite thousands or even millions of people die in the war, the closest you would ever see is someone getting blown up in the mecha. Ground forces without mecha just don't get killed. Even if they do, it's done off screen elsewhere and someone report them in. 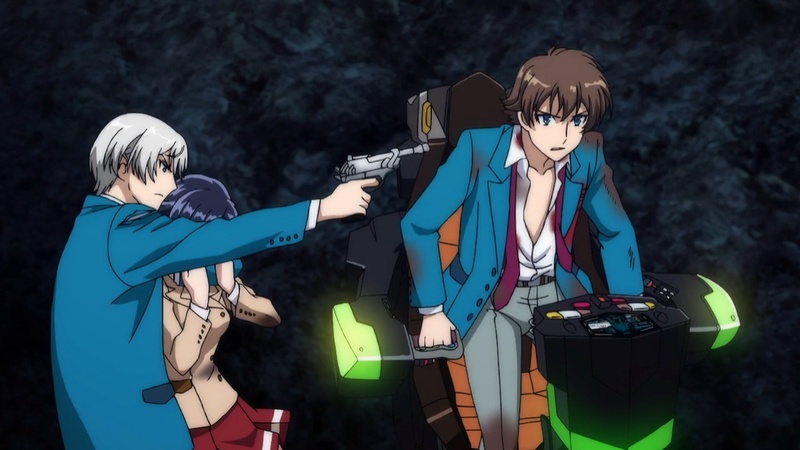 Here in Valvrave, they're taking a no nonsense approach where they show up close that war kills. I mean really, have you seen any mecha/galactic warfare anime where they show someone just come up to the guard and shoot them dead on the spot without changing camera angles? It might have something to do with that the protagonist is in need of learning peace doesn't exist in war, and was just taught in one of the most brutal way early in episode one. But either way, I applause for the degree of realism in their attempt trying to portrait how brutal war is. Even though I'm not a mecha fan, I'm actually quite interested in this anime.